Swedish Bitters is a traditional herbal tonic, that might help to cure number of illnesses and mainly to help normalize digestion system. Consists of 22 ingredients, packaged as a dry mix. Weight 210 gram. Imported from Austria and Germany. Our ingredients are free of pesticides. Only authentic Swedish Bitters imported from Germany. Important to know! 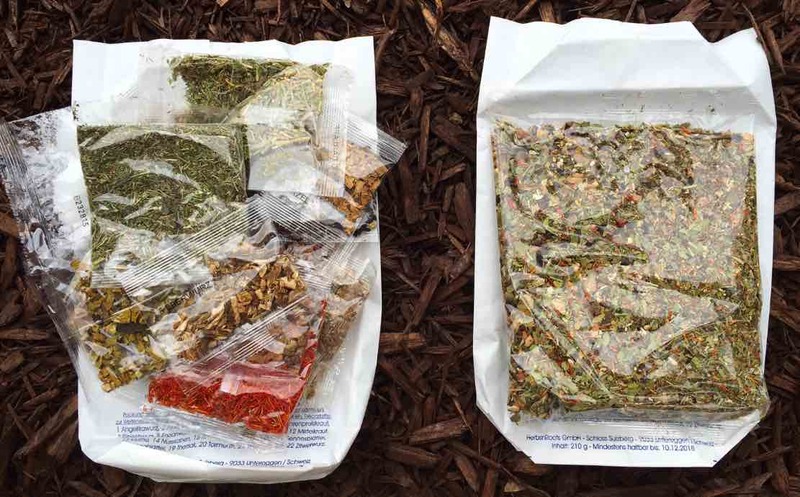 In connection with the progressive pollution of the European Green Capital and European Green Leaf Awards, since the beginning of 2016, the herbs of the Original Swedish Bitters mix will no longer be individually packed into plastic or polyethylene. Beware of fakes! If you are offered the same mix of the Swedish Bitters with each herb packed individually in polyethylene or plastic – this is a copy or a fake of the original famous Swedish Bitters mix by Stefan Zwerenz. Swedish Bitters is a herbal mix that helps fight various diseases; an infusion can be taken for pain or problems in the digestive tract, for the normalization of digestion, helps to cleanse liver and blood and some say it was effective as a treatment for Candida. Can be helpful in the treatment of allergies, skin conditions and some hemorrhoids. Swedish Bitters has also been used as a mild laxative tonic. Taking Swedish Bitters may help those who suffer with inflammation such as arthritis, swollen joints and sprains. There are also reviews, testimonies and recommendations that this specific tinctures of herbs can clean the body of toxins. In addition, the reception of bitterness helps to cope with the symptoms of some diseases of the gastrointestinal tract (nausea, vomiting, lack of appetite, heaviness in the stomach, bloating, heartburn, constipation, etc.). One of the main functions of the Swedish Bitters is to promote secretion of pancreatic and gastric juices and soothe the digestive tract. Swedish Bitters stimulates liver functions and promotes secretion of bile from the liver that serves to emulsify or break down dietary fat and clear cholesterol out of our body. Having a healthy liver will enhance the overall digestion process and prevent bloating and flatulence and ensures a smooth nutrient absorption. The Swedish Bitters name, at first seems likely that the ingredients come from the country of Sweden (Swedish), but this is not the case. The name derives from the Swedish physicians Dr. Claus (Klaus) Samst. The elixir is said to be the creation of Swiss physician, Dr. Phillipus Paracelsus, who practiced in the 1500s. However, it wasn’t until the 18th century that it was formally labelled Swedish Bitters by Swedish physicians – Dr. Claus (Klaus) Samst. The mixture with the different medicinal herbs was already long known in the family of the Swedish health-care professionals, but forgotten. The physicians, Dr. Claus (Klaus) and Dr. Urban Samst Hjärn found this in the 18 Century, returned and helped many people with different problems and illnesses. It is believed that the formulation of a similar drug also belongs to the physician Philippus Theophrastus Bombast von Hohenheim Aureolus (short: Paracelsus), who lived in the 16th Century and suffered much of a criticism from pharmacists and doctors, despite his successes in Herbalism, it was considered as an alternative to traditional medicine. Dr. Samst died at the age of 104 years in a riding accident. It is said that his ancestors lived a long life and have reached a biblical age. A renaissance of Swedish Bitters herbs was done by Maria Treben that examined Samst’s “old manuscript” which detailed the efficacy of the bitters on over 40 medical conditions. Maria Treben published the recipe of the mixture in her book “Health from God’s Pharmacy“, which remarkably run out of over eight million copies. Her specialty was herbal medicine and alternative treatment methods (for the priest and Hydotherapeut Sebastian Kneipp). If suffering from headache, of feeling dizzy, smelling the Swedish Bitters herbs, or moistening the head with diluted Swedish Bitters with water can be helpful. Placing a piece of cloth moistened in the Swedish Bitters tincture on your eye lids can help to reduce eyes inflammation, eyes redness and help with blurriness. Sores and scabs on your body might disappear and get cured if moistened with the Swedish Bitters tincture. If suffering from a toothache, dilute a tablespoon of Swedish Bitters tincture with a glass of warm water, and rinse your mouth and teeth, it should help to reduce toothache. In case of a sore throat take a tablespoon of Swedish Bitters tincture three times per day internally. Rinsing your sore throat with the Swedish Bitters tincture is also very helpful. If you have stomach-cramps, taking a tablespoon of the Swedish Bitters tincture is very helpful. In the event of a sudden stomach pain, take 2 – 3 tablespoons of Swedish Bitters tincture internally. If having a painful menstrual period, its helpful to take 1 tablespoon of red wine with a few drops of Swedish Bitters tincture in the morning on an empty stomach, for the period of 3 consecutive days. You can have breakfast 30 minutes after taking Swedish Bitters, but do not consume milk. Swedish Bitters tincture helps to cool the liver and to prevent inflammation. Swedish Bitters tincture can help with indigestion and dehydration problems. Using Swedish Bitters tincture can help to clear clogged arteries, can help with the kidneys problems, or if suffering from melancholia and sweating. Swedish Bitters tincture can help if suffering from internal and/or external hemorrhoid knots and to relieve burning sensation. Moist a cloth with Swedish Bitters tincture and place it over the hemorrhoids overnight. When having body aches or feeling weak and powerless take a tablespoon of Swedish Bitters tincture. Apply Swedish Bitters tincture to wounds for faster healing. The Swedish Bitters tincture can help to cure ulcers, deep cracked skin on hands and warts. In case of insect-bites moistening effected area with Swedish Bitters tincture might help, if used immediately. Using Swedish Bitters tincture can help to restore appetite. If you are suffering from arthritis pain, rub your lymph nodes with Swedish Bitters tincture twice a days, in the morning and at night. Swedish Bitters tincture can help with frostbites on hands and/or feet. Swedish Bitters tincture can help to heal animal bites. Use Swedish Bitters tincture to get rid of calluses. Take a tablespoon of Swedish Bitters before going to bed if suffering from insomnia. You will improve digestion, and overall health of your body when using Swedish Bitters tincture daily, every morning and evening. Click Here to read more about the benefits of the Swedish Bitters – Schwedenbitter. Archangelica, Aloe Barbadensis, Lycopodiaceae, Pimpinella, Carlina acaulis, Veronicae herba, Althaea, Gentian lutea, Acorus calamus, Cinnamonum amphora, Kandis, Viscum album, Commiphora, Jugladaceae, Rhei radix, Carthamus tinctorius, Sennae folium, Ginkgo biloba, Theriaca, Potentilla erecta, Artemisia absinthium, Zedoariae rhizoma. Click here to read more detailed information about each ingredient of the Swedish Bitters that we sell. Open bag with Swedish Bitters herbs and place in a glass container. Add 1.75 to 2.00 litters (about 60 to 70 oz) of vodka, fruit or grain brandy, stir and close the air tight lid of the glass container. Leave your mixture in the dark place from 14 to 30 days or more (the longer the Swedish Bitters mixture sits, the more potent it will be) shaking or stirring daily. After 14 to 30 days or more, drain the liquid elixir in a separate clean container (preferably glass container) through a strainer and store it in a cool, dark place. Swedish Bitters are suitable for consumption for up to 36 months from the date of preparation. It’s recommended that the balm is stored in a cool place for up to 3 years. ALCOHOL FREE SWEDISH BITTERS – PREPARED AS A TEA, FOR THOSE THAT ARE INTOLERANT TO ALCOHOL. Most of the Swedish Bitters are usually made with 40% alcohol using vodka as a base. If you are intolerant to alcohol, there is possibly less effective but alternative way to prepare Swedish Bitters in a form of an herbal tea. Even though alcohol is the most effective way to make Swedish Bitters, it can also be prepared as an herbal tea. Open bag with Swedish Bitters Ingredients and blend them together in one container. Take about two teaspoons of the dry Swedish Bitters ingredients and place them in a teapot. Use about 5 cups of boiling water and poor in a teapot with Swedish bitters herbs. Stir frequently, and when it’s cooled store it in a fridge. Add two tablespoons of the cooled Swedish Bitters tea into a cup of boiled warm water and drink twice per day. You can also mix the cooled Swedish Bitters tea with a juice using same proportions. Shelf life of the Swedish Bitters tea is about 3 – 5 days, so when making a tea, do not make more then you can consumer in 3 – 5 days. It is recommended that each individual take a teaspoon of Swedish Bitters 2 – 4 times daily before meal. If the taste of the Swedish Bitters Mix is to bitter, dilute it with herbal tea, water or juice. Skin to be treated should first be carefully greased with something like marigold or calendula ointment, so that there will be no irritation or burns to the skin from using Swedish Bitters. Soak a cotton ball in Swedish Bitter and apply it to the area that needs a treatment. Dispose used cotton piece after each application, to avoid the contamination. The cotton ball soaked in Swedish Bitters can be left applied on the treated skin area for 2-4 hours by securing it with a gauze bandage over the wound depending on the symptoms, or even for all night. After removing the cotton ball, let the skin air dry. If your skin is very sensitive and gets easily irritated, leave cotton ball on the treated area of the skin for a shorter period of time. DO NOT forget to apply ointment to the skin. You can also use Swedish Bitters to reduce all types of inflammations by applying Swedish Bitters mixture to the affected areas. If you are suffering from a sinus infection, apply and rub Swedish Bitters onto your forehead and over the bridge of your nose several times a day. The essential oils used in the mix will help to kill the bacteria causing the infection; Swedish Bitters mix also helps to thin the mucus clogging the sinuses and promotes drainage of the sinuses. If you have hemorrhoids, apply diluted Swedish Bitters several times a day to the affected area. Before bedtime, soak a cotton ball in a diluted Swedish Bitters Mix with water and secure it to the effected area. If you suffer from tonsillitis, use the Swedish Bitters to fight the tonsils infections. Mix 1 teaspoon of Swedish Bitters elixir with warm water and gargle with a mix twice a day. If you need to improve your digestion or ease stomach cramps or constipation, take 2 teaspoons of Swedish Bitters in the morning and evening before meals. To use Swedish Bitters for blood-purifying or soothing properties, or to treat skin problems, gastric bloating, gall bladder diseases and heartburn – take 1 teaspoon of Swedish Bitters 30 minutes before and 30 after the meals. To maintain health digestion, take 1 teaspoon of Swedish Bitters 30 minutes before each meal, but no more then 3 times per day. Please Note: The aloe used in Swedish Bitters mix can for some act like a laxative. Pregnant women should also avoid using Swedish Bitters because it can cause uterine contractions or damage to the fetus. Kids before 12 years of age should also avoid using Swedish Bitters. Swedish Bitters can also have negative effect on any medication that you might be using. Always consult your doctor before using Swedish Bitters. Great product if you care about your health. Highly recommend using it. Not only bitter is a great product, your website has best prices in USA. I use to buy this same exact product from Ebay for over $30 and some are listing it for $44 plus…. where you are selling it for $21.99?! Thank you! My name is Jens Demmer from Germany and I made a lot of wonderful experiences with Schwedenbitter over the last decade. I read in the news of Brittany Maynard. She has a tumor in her brain and decided to die October 31 in Oregon by free will. Do you see a chance to advise her to use Schwedenbitter? She is in Portland, Oregon. I’ve been searching for natural immune boosting products for a long time. Frankly speaking I’ve tried a lot, unfortunately my money and efforts to improve the immunity had gone to waste ;-((( I wanted something that really works and made with natural herbal ingredients. My friend recommended me Swedish Bitters and assured in its quality and good results. Of course I didn’t believe any more, but she insisted. Thanks Goodness, she was right and to my big surprise the price was good!!! Now everything in my body goes right! No side effects, no dependence. I like to make the tincture myself and I’m always sure about its quality, because I see the ingredients and even more I can experiment with them! It’s really a great idea to have all them packed in individual plastic bags. I can’t put everything into words, so just thank you for everything you do here!!! And yes, I love your blog! Swedish Bitters is an outstanding digestive aid, as well it provides numerous other health benefits, used both internally and externally. In addition to information on this site, there is a whole chapter on Swedish Bittes in an excellent book called “The Family Herbal” by Barbara and Peter Theiss it’s A Guide to Natural Health Care for Yourself and Your Children from Europe’s Leading Herbalists. Before I discovered WellbeingHerbs.com, I purchased cut herbs for homemade Swedish Bitters from several different sources in the US and abroad. There was little consistency in quality, freshness, potency in formula and it showed in the end-product. The only thing I could count on was the high price, although I don’t mean to be so negative. What I want to point out about Swedish Bitters from WellbeingHerbs.com is the reliable high quality, freshness and potency of the herbs that I’ve been buying for quite some time now. The 22 ingredient formula is unique, effective and more palatable than anything I’ve tried. (I do modify it slightly by adding a bit of saffron and manna, while cutting down on the Kandis.) The care with which each ingredient is individually packaged demonstrates a commitment to offer only the best. The extra effort shows in everything but the price, their price is the most reasonable I’ve found. So buy your herbs here and good health to you! Just want to say thank you! I am not a fan of writing reviews, but felt like I should let people know this. Not sure what Swedish Bitter has in it that makes a such effect, but I just made my mix, and started taking it daily as proposed on this website. I am a 37 year old male, I lost 7 lb already, without changing my diet at all, and every time I eat, I feel very light…. not hungry, but light. Getting the feeling like everything I eat gets digested really well! Really like how I feel…. That’s all I wanted to let you know. Plus by using this product you have the leftover herbs when can also be used for healing purposes. I am very happy with these herbs. Have been using Swedish Bitters mix for past 7 years to keep my immune system up and running. Not sure if this is how good Swedish Bitters is, or coincidence, but I just don’t get sick anymore. I didn’t know what to expect from this Swedish Bitters potion when I first started taking it. I’ve been exposed to black mold for several years without knowing it and this treatment with Swedish Bitters helped to make two particular symptoms disappear. One of them was night time anxiety- I would wake up in the middle of the night worrying about stuff that was no worry in the day time. The other one was loss of dexterity – I felt like I was in a mental fog and my hands lost the ability to grasp properly and I was dropping things if I weren’t careful. After taking a course of this treatment both of these symptoms disappeared. I am as well taking it on as needed basis to deter cold or flu, and it seems to be very helpful as I think it is boosting my metabolism. I take a sip as soon as I get first symptoms and I can say it’s been pretty effective for that as well as I usually only have to do it once and avoid being sick due too cold symptoms. A friend of mine told me that his daughter had a throat cancer, and he was treating her throat with Swedish Bitters mix and she got cancer free. I had issues with kidney stones long ago, until I met an older man and we started a conversation. I noticed when he was reading he was not using spectacles and I asked how is it that he has such good vision. He told me that he is using Swedish Bitters. He was rubbing Swedish Bitters every morning on his eyelids and he said it would work to remove Kidney stones as well. I went and ordered one packet and made a mix with 2 litres of Vodka, left it for 14 days as recommended and then strained it into a container and started taking a tablespoon every night. Never had stones anymore… its now about 20 years. I would recommend consulting your doctor before you do this since some stones can be large and might be stuck in your tubes which can cause severe pain, infection and even death. I’ve read many testimonies about Sweden bitters and I need this mixture. Is there anyone who can help me to buy this mixture? We ship our Swedish Bitters worldwide. We will get in touch with you and help you no matter which country you are from. Good day! Will the Swedish Bitters help for the constipated stomach? please help! My mother made and took doses of Swedish Bitters since Maria Treben’s book was published in the early 80ies. She is now 96 and still going strong. I have been using it internally and externally and am still amazed at its effectiveness. I wouldn’t be without it. I’ve read the book and would like to have the original formula of Swedenbitter tor my mother’s hearing problem. Do you ship to Israel? What amount should I buy? Yes, We ship our Swedish Bitters to Israel. I would recommend buying two packages, this way it will be enough remedy for you to use for the next 5 month. Also, you will save on shipping this way. I have too much protein in my urine as I am diabetic. It is at 99. Will swedish bitters help me get my numbers back down to 30? During the day, levels tend to be at their lowest just before meals. For most people without diabetes, blood sugar levels before meals hover around 70 to 80 mg/dL. For some people, 60 is normal; for others, 90. I would rather grow and collect all these roots and herbs myself, but it proved to be way too daunting a project for me. I am soooo glad someone else has done that part for me and all i have to do is pick which vodka i want to use to steep them in, hahaha! I’m sorry they no longer package the ingredients individually but still, i’m very happy with this product! Planning to use this product… the reviews I have read is enough to say the product is good. My question is: how can I separate Kandis from the mixture when all the herbs are in one package? and not individually packaged like it used to be. 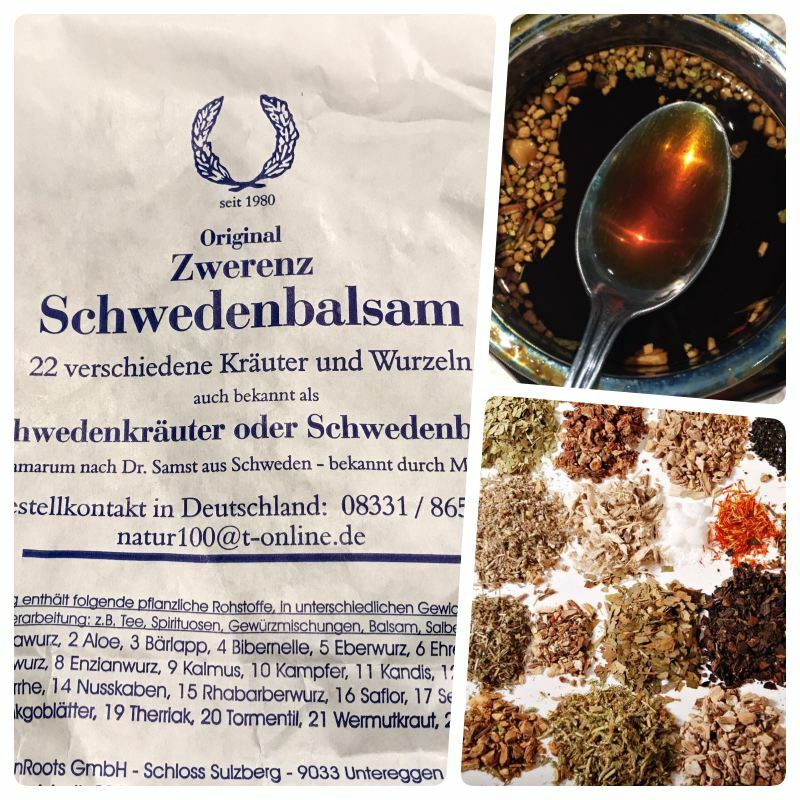 I also read this on the site- *beware of fakes* if you are offered the same mix of the Swedish Bitters with each herb packed individually in polyethylene or plastic – this is a copy or a fake of the original famous Swedish Bitters mix by Stefan Zwerenz. I’m confused now! Secondly, do you ship to Ghana please? To separate Kandis from the mix, please place content of the package into a bowl with a warm water and stir to let the kandis dissolve, then strain and make your mix. You can also hand pick small white Kandis crystals from the mix. Few companies made a mix using herbs that are different then the original Stefan Zwerenz mix, but also using 22 ingredients. The product is also packaged in USA and not Germany. Yes, we do ship to Ghana. Do you carry and ship the Swedish Bitters Cream? did not see it on webpage. I am buying the herbs for the bitters from big pharmacy but it only has 11 herbs in it, your Bitters seems much better. Please let me know about the Bitters cream. thanks! You can find Swedish Bitters cream on this webpage: http://www.wellbeingherbs.com/product/schwedenkrauter-cream-100-natural/ and yes we do ship our product world wide. Do you think Swedish Bitters can help me to take care of my endometriosis? In attempt to clean liver you can try using Swedish Bitters… but problems eventually will return. I would suggest you talk to your doctor about the endometriosis issues. Hello, Can I take Swedish Bitters during breastfeeding? Is there any problem for my baby? It’s not recommended to take Swedish Bitters during breastfeeding. There are testimonies where Swedish Bitters mix can help when suffering from arthritis, however there where no case studies that was done to say that it will help for sure… and yes, we can ship to Nigeria. I see how I could leave Kandis out of the mixture. However, I cannot take senna and it doesn’t appear to be something that I would be able to separate from the rest of the herbs. Any suggestions? Dear Serita, unfortunately there is no way to separate Senna from the mix. Hi, can I use tequila instead of vodka? Yes, you can you Tequila to make Swedish Bitters remedy, please use Tequila with 40% alcohol content and 80 proof. I just received the package and it is all in one. 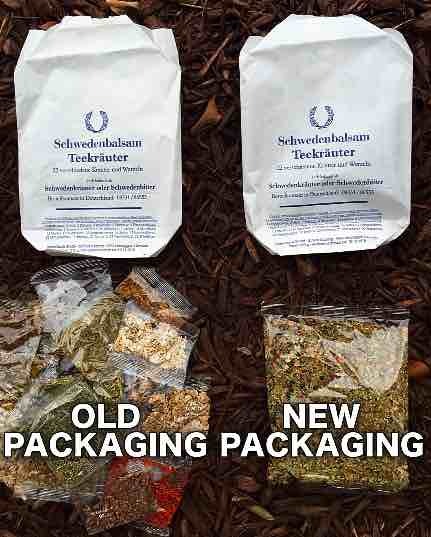 Although your site warns against lindividual packaging, how else will we know we got all 22 herbs? Dear Jennifer, our product is imported from Germany, and USA customs check our products when it enters USA. Also, Germany has a very strict packaging regulations, so if packaging has 22 ingredients listed, please be rest assured all 22 ingredients are in the package. I just bought a pack and i am about to drink of it at bedtime, i will write my testimony in a week or so. Thank you so much Etiyeh! Product Benefits: Helps to improve digestion. 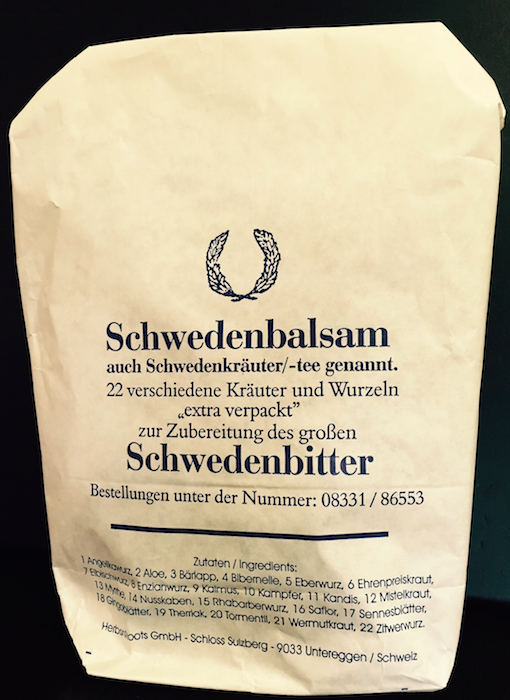 SCHWEDENKRÄUTER – Everything about Swedish Bitters in German. Dieses Rezept, welches in Schweden bei einem berühmten Arzt nach seinem Tode in seinen Schriften gefunden wurde, wird als eine sichere Anleitung, das Leben zu verlängern, angesehen. Der Arzt soll mit diesem Mittel seinen Großvater auf 120, seinen Vater auf 113, seine Mutter auf 107 und sich selbst auf 104 Jahre gebracht haben. SWEDISH BITTERS NATURAL CREAM – Maria Treben. Made in Germany. Therapeutic and protective cream for skin care, made with Swedish Bitters Herbs, that are used in a very well knows Swedish Bitters balm. Swedish Bitters herbs and extracts from them contain large amounts of natural medicinal substances. For External Use Only. Consists of various components – 100ml. Product of Germany.